Listed below are a number of favorite websites that support student mastery learning. Many of the sites below will be assigned as homework during the school year. Please be sure that your child knows how to log in. Student login and password information is taped into homework folders for students in grades 1-4. Students in grades 5-8 have access to all of their account information in the Tech Lab. It is expected that they will write down account information to use at home. Every student has a mathletics username and password. The usernames are the child's initials and a series of numbers. The passwords are simple words and numbers. Example: my username might be: CK-14593 and my password might be: teacher45. We use this combination for the following accounts: Mathletics, BrainPop, Edmodo, PowerSchool, Lexia and Spelling City. Additionally - every student has a google account. This is created using the year of 8th grade graduation + first name + school account. The password is pw + mathletics password. Example: an 8th grade student might be - 19Carol@sfststephenschool.org and the password might be pwteacher45. This google account is used for the following accounts: All Google Apps (classroom, drive, docs, sheets, forms), KhanAcademy (be sure to use the red google button), Typing (be sure to use the google button). Accounts with individual usernames and passwords: HappyNumbers, Raz-Kids and xtramath (For xtramath - please use your child's name and password and this email address: cking@sfststephenschool.org). This information will be in your child's homework folder. ​Raz-Kids (K-5) students have grade level accounts. These accounts are currently being updated based on STAR results. For Fun - and still academic! 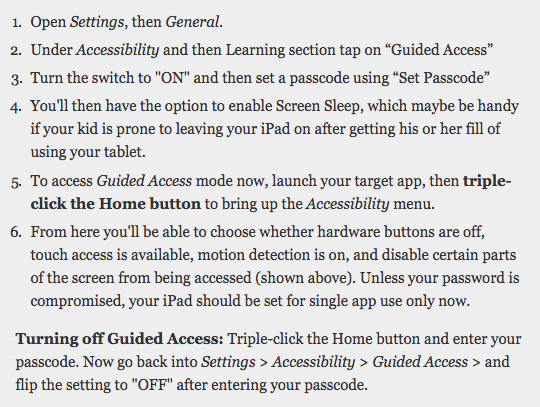 To lock your child's iPad to a specific activity, please activate Guided Access by following the directions below. This will enable a student to focus while they are studying at home, and can set time limits for iPad activity. Please remember to return the iPad to standard settings before your child returns to school.